Sorry for the delay on getting this recipe to you guys, but here it is! It is so simple I didn’t think it would warrant a recipe, but your requests on Snapchat and on Instagram has me thinking otherwise, so here is the quick and easy recipe to something so simple you can have for lunch, dinner or mealprep! I hope you love it as much as I did. Too simple, and a great way to get those veggies in without much effort (especially if you want to trick those in your life who aren’t a big fan of broccoli). Place the chicken in a single layer in baking pan and rub the chicken generously with the spice mixture on all sides, cover it with a plastic wrap and refrigerate overnight or for at least 2 hours. You can also use a gallon Ziploc back for this. Cook 1 cup of brown rice according to instructions. Will yield 2 cups cooked rice. Steam or boil 1 head of broccoli, chopped into single florets until tender. then coarsely or finely chop them so they can easily incorporate into the rice. Pan-sear marinated chicken breast in 1-2 tbsp of olive oil for about 3-4 minutes per side (depending on thickness of fillet) until cooked through with a nice brown sear. Add cherry tomatoes to pan in the last 2 minutes of searing chicken, so the flavors are incorporated in the cherry tomatoes. 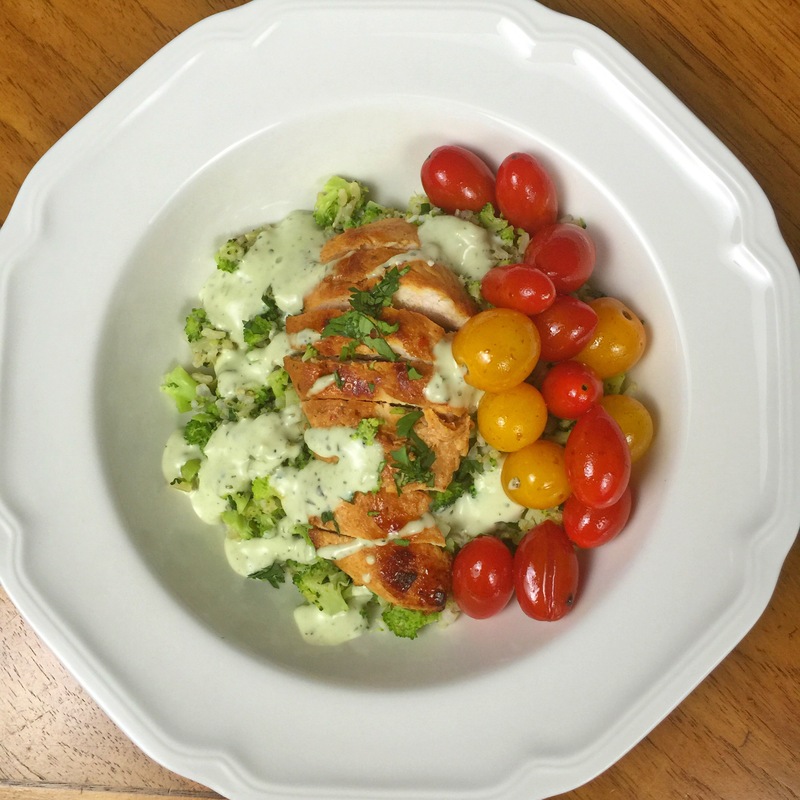 Serve chicken over rice with cherry tomatoes and drizzle yogurt cilantro sauce over everything for added yum-ness! SNAPCHAT: AnaSandee – I cook and Snap, and YouTube and have fun! Follow my Snapchat for all my recipes before they make it to the blog and to YouTube. Beware of belly appearances! Check out the YouTube for consolidated recipes! 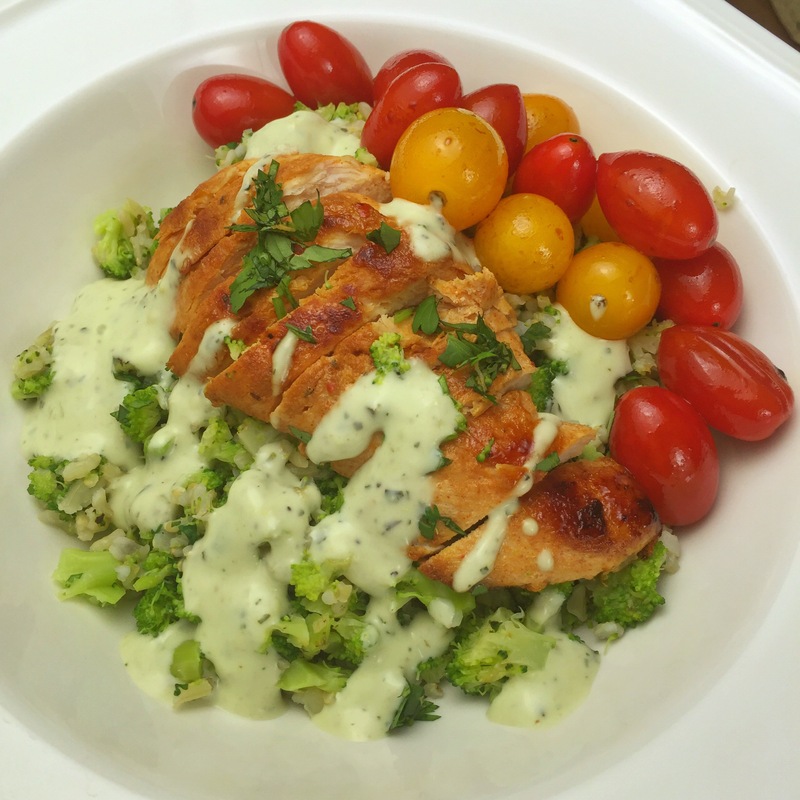 This entry was posted in Dine with me, Entrees, Meal Prep Ideas, More On Meal Prep, No More Boring Chicken, Uncategorized and tagged broccoli rice, cilantro yogurt sauce, no more boring chicken, santa fe chicken, yogurt cilantro sauce.